So, I'm in Vail and have been since Tuesday evening, on vacation, which explains why I've been silent for about a week. I've got to admit that I have a very hard time being disconnected. Not being able to check email, read up on recent news or IM friends leaves me feeling out of touch. But, at the same time, I recognize that it's not entirely healthy to ALWAYS be connected and available. Every once in a while I need to shut things off and just veg out with my brain only working on 2 or 3 things at once instead of 10. Good point.. back to the slopes. I'm not terribly good at separating myself from work. I never have been. For me, time is fairly fluid and I can be out having fun with friends and also thinking about work. Over the years I've found that I often have a hard time even recognizing this trait and identifying when I'm bringing stress with me. So, recently, I've focused on more cleanly separating work and any related work stress from when I'm enjoying "my own" time, as it were. As a result, I find myself thinking more about what it means to "have a life" and how any of us can, in an increasingly connected and fluid world, separate work from the rest of our life. A few weeks ago, I locked myself out of my apartment. I've managed to do this a couple of times but have fortunately been able to creatively get back into my place (read: break-in) without much hassle. This time, however, I was completely out of options and had to go ahead and call a locksmith. It turns out, for those of you haven't had to do this, that within San Francisco there's a 24 hour service you can call that dispatches locksmiths, almost like cabs. Within a few minutes of calling I was informed that someone would be over in 30 minutes to an hour. After hanging up, my three friends who were patiently waiting with me asked me how much it was going to cost. My answer? "Does it matter? Because I'm going to pay it anyway." I was hoping it'd be cheap, but didn't expect it, since they had me between a rock and a hard place. 45 minutes later, just before the locksmith picked my lock, I found out the cost: $130. $55 for the visit and $75 for the "service", which took approximately 20 seconds. Shaking my head as I give the guy my credit card, I ask him if he's very busy. "I can't even get laundry done," the guy says to me. At which point I realize that the way this works is that the guy's just on call and gets dispatched from wherever he is to go open locks for idiots like me. Given that it's 11 p.m. on a Saturday night, and his efforts to do laundry have been stymied by me it dawns on me that this guy and I struggle with similar issues. I follow up with another question, "Does it pay well at least?" He nods, "Money's good, but you have no life." Better than I could have said it myself. I suppose I should take solace in the fact that I've left the job (I-banking) that made me feel the same way and am working towards figuring out how to better balance my life. But what it really makes me wonder is, who actually manages to have "a life" these days? I look around and see a lot of people struggling with their increasing connectedness. Work and free time aren't separated by the boundaries of location anymore. You can check your voicemail/email/text messages anywhere, you can get contacted whenever necessary. "Working" for myself and those who I know isn't as much defined by a physical act. It's more mental these days, which means that I could be snowboarding in Vail and have an insight into something pertaining to work. That's how my life is these days, "working" at home, or on the slopes, socializing with friends while at work. As we lose the simple boundaries, do we need to establish new ones that are more complex in this connected world? Should I be setting a timer that keeps track of how many hours a week I've devoted to thinking about work? Or, is it something else? Do we work to find jobs that are so enjoyable and aligned with our interests that the fact that we're working all the time doesn't matter? Ok..calm down, yes, very very funny. Hell, watch them again, they're that good. Now, does anyone have any video editing skills? This seriously calls for a mashup.. help me out here. Shoot me a comment if you want to play around with this. Let's create something funny. 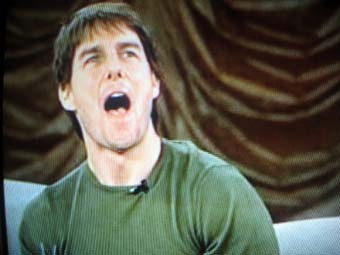 Newsflash: Tom Cruise is speaking at Yahoo! tomorrow! That's right, Mr. Scientology is going to be hanging out in URL's, live and in-person. So, some people are expecting it to be a train wreck. Others are annoyed that Yahoo! 's paying someone [inviting someone] who seems kind of wacky/preachy/crazy to speak. Me? I expect that it'll be rather tame, rather scripted and perhaps surprisingly fun. The guy's an actor right? He gets paid the big bucks to entertain and although recently, he's been entertaining us with antics that aren't on the big screen, I'm pretty sure that a corporate speaking gig is a pretty routine event for him. But, just once, I'd love it if an event like this occurred and it was totally unscripted and off-the-cuff. Since I can't have that, I've decided that I'd at least like to put together some questions that I wish we could ask Maverick tomorrow. “Wow, you’re short in person. That’s all I had to say." What would you ask if you had the chance? Unedited, funny or serious, comment and I'll throw some of the good ones up into the list. **Quick Update** As was mentioned in a comment, there was no payment for Tom Cruise's appearance - Terry mentioned it in his introductions. I'll update later with an actual post about the event, which was very interesting and fun. Having previously spent part of my shuttle ride home mulling over the pain of using the mouse on my laptop and the broader question of interface design, I found myself thinking about user interface some more. I was wondering about what kind of talent you'd need to hire in order to ensure successful UI design. In thinking about how you might go about putting in place a team that was very smart about designing consumer interfaces, particularly dumbed down interfaces for media devices, I realized that there's already a company that is REALLY good at this stuff, at least in my mind. In fact, I think they're so good at it that they've basically designed the interface equivalent of crack - once a user comes in contact with it, they're hooked. No, no, not Apple. Anyone played with a Newton lately? Besides, their laptops all have those stupid touchpad mouses too, so they're not that smart. If you've ever used a Tivo before, you're probably nodding your head right now, thinking about its addictive properties. Once you've used Tivo to watch tv, you become hooked. Not only is the simple capability to pause and record live tv amazingly useful, but the overall Tivo interface (by that I mean the remote plus the on-screen navigation) is simply amazing. It's intuitive, not overly complicated , leads users down a path of feature discovery and it is rewarding. It literally makes me want to go back to that experience more and more often. I choose not to watch tv in "real-time" anymore, because watching it with Tivo is just that much better. Now that, THAT is a pretty unique design capability. *Disclosure time* I own Tivo stock. But, I've been disappointed with it. I bought in because of the incredibly vocal user base. People who love the product so much that they actively evangelize it to anyone whenever the subject of television comes up in conversation. I bought in because I believe in the long term value of the subscription model. I bought in because I believe in their ability to deliver targeted, user-driven television advertising. To date, Tivo hasn't done a terrific job of executing against these opportunities. This is maddening. Fundamentally, the company has a distribution problem and I don't see it going away any time soon. So I've been thinking about exiting my position; to take my losses, learn and move on. HOWEVER, I do see an avenue for potential game-changing success. If you accept for a moment that Tivo's interface design is phenomenal and really helped spur the entire DVR market on with its usefulness, then you might think to yourself, "Hmm, that Tivo sure has a good understanding of user interface needs." In a world that is becoming increasingly populated by devices, particularly media devices, it seems to me that what we're desperately in need of are some device user interface experts. Furthermore, those interface experts that we have are facing the dual challenges of designing the best interface and balancing it with the associated hardware and manufacturing costs. It's not as simple as just building software that applies to any device. If it is, well, we know who's going to win that game. But, I think that there's more to it, because of the ongoing pace of innovation in the device space. Given that Tivo's faced both hardware and software challenges, it seems to me that maybe they're best positioned to capitalize on the need for design expertise. What if Tivo was to experiment with this side of the business, spending time dreaming up a few devices that they think others should make? What if they were to create a service organization focused on designing the interfaces for consumer focused media devices? What if they were bought by a large company that cared a ton about how design in the media device future was going to impact their business (Sony, Nokia, Motorola, Intel etc)? Yes, this idea is totally off the wall and highly unlikely, but I often like to ask those "What if?" questions that people don't spend enough time thinking about. I think that in the case of Tivo, the tea leaves point to a declining growth rate, a lack of significant distribution and a pricing/margin problem that paints them into an operational corner. If I was them, I'd be scrambling around, trying to think about what other options they could pursue while still relying upon the same talents and core competencies. So, if I was them, I'd be focusing on design and I'd be telling every other company that was somehow dependent upon the design of media devices that they needed my expertise going forward. I'm pretty sure that'd resonate with more than a few people. So, Friday evening, I'm hanging out at home, finishing up some work. My phone rings. I look at the clock.. 6:00, on a Friday. Hmm, that's a little early for telemarketers, but let's see which one is calling, I think to myself. "Hello, Mr. Ganguly? Yes hi this is.... from NRI Business Solutions," the man on the other end says, in a very heavy Indian accent. After a few more moments of chatting, it quickly becomes clear that this company (www.nribusinesssolutions.com) is headquartered in India and is trying to provide services to those who wish to do business in India. In general, when you're not in the country, it can be difficult to get things done in India. From shopping to making travel plans, it sometimes can be easier to do it over there and they're calling me, offering me services that they can provide in India. I'm intrigued, but the guy eventually loses me when he starts mentioning marriages and such. But he's polite, makes multiple efforts to name the website, to spell it out and to give me their toll free number. He's calling from New Delhi, as well, I find out, which is interesting too. I wonder how much it costs them to call me. I wonder how they get my number.. is there someone out there who has a list of Indians that I ended up on and then they called me? Or did they just cull the phone books looking for my name? Small questions, maybe not that important really, but I'm curious. What's really interesting though, is the eagerness and the marketing prowess of some small firm in India. That they're calling on me, just a 28 year old half-Indian kid, to see if they can sell me some business, says that the world really HAS changed. Now, isn't it about time that some of our small businesses started calling on them :)?